*Most bias supplies in fixed-bias amplifiers are too low in voltage and/or too high in impedance to fully support the Power Scale regulators. For these amps, RBX Raw Bias Auxiliary Supply should be used. It is never a mistake to use RBX. See the note below. 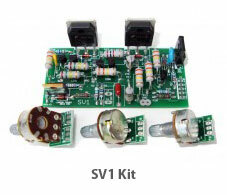 Note that the older products SB-1, SB-2 and SB-84 PCBs are still available for licensed users of these products. When Do You Need the RBX Raw Bias Supply Kit? Most guitar amps that are fixed-biased have very poorly designed bias supplies. Most are barely adequate to support the tube grids connected to them, and few have enough control range to actually turn the tubes 'off'. The problem with these stock bias supplies are two-fold. First, they are usually "high impedance", which means they are derived from the plate winding through very high value resistances (100-220k) or through capacitors. A high-impedance bias supply cannot support proper bias-set networks nor will it support a bias regulator. The second issue is that they lack enough voltage range to properly control all samples of tube that may be plugged into the amp.Resistively-derived bias supplies can have this range, but will lack the current needed for a bias regulator. Decreasing the series resistance creates a high amount of waste heat and the bias regulator could be damaged by excess voltage to its input. Capacitively-coupled bias supplies are inherently limited in both their voltage range and current output. A separate bias winding has the potential to be "low impedance" and also of high enough voltage to properly support a bias regulator. Marshall's 1959 and 1992 models use bias windings of sufficient voltage to properly support a bias regulator, provided the stock series resistances in the supply are reduced to 470R each. Although many Fender amps have separate bias windings, these are all too low in voltage to support a Power Scale circuit. Hiwatt's bias winding will work if the bias supply is rewired as a voltage doubler, which requires lifting the gorunded end of the winding. See TUT2 for details. So, unfortunately most fixed-biased amps will also require RBX Raw Bias Auxiliary Supply if proper performance is to be attained from the SV1 or SV-TT Power Scale kits. The very earliest Power Scaling kits included RBX along with a BMK Bias Mod Kit, but these add-ons are not required to achieve Power Scaling, nor are they universally missing or required with newer amps, so the kits were separated so that installers could buy just the parts they needed. This also made the basic Power Scaling kit much less expensive. Who can install Power Scaling for you?